For many of us there are moments in life, incidents that occur which were unplanned and unexpected, and which leave long lasting impressions. One of such occasions for us was what took place a year ago on June 2nd 2012 when late in the afternoon we received the first of numerous calls telling us that the Chitokoloki Mission plane had crashed into the Zambezi River approximately 40 kilometers North of the Mission. The events that unfolded from the minute we got that phone call have impacted us immensely and caused us to dig deep into our Faith in God who knows the end from the beginning. We know that nothing happens without His knowledge or consent. If we believe in the Sovereignty of God, as we claim to, we must accept and believe that Jay and Katrina Erickson, our fellow missionaries, did not die in the plane crash in the way they would have chosen or wanted to, but they did die the way God intended them to. It is not how long we live that counts but what we do with the time that God has given us here on earth, Jay and Katrina used their time to serve the Lord. Now they are with Him enjoying what many of us are still awaiting to experience, the wonders of heaven and seeing the Lord and being able to thank Him for His offering of Himself on the Cross for us. Those next few days were the hardest we have ever had to deal with, especially the phone call at dusk a couple hours after the crash to Jay’s parents, made standing on the banks of the Zambezi River right near where the plane was submerged in the river although no visual sight could be seen of it. The following day it took several hours before we could actually locate the plane. It was only with the Lord’s help and the prayers of Believers all around the world that enabled us to make it through. We were humbled and amazed at the thousands that have communicated to us and were touched by this incident that occurred here in a remote location in Zambia. Hard as it was for us here and also Jay and Katrina’s family in the USA, we are thankful that God has used this incident for souls being saved. The world would call it a “tragedy” but we know there is no such word can be used where God allows it for His Name to be honoured. 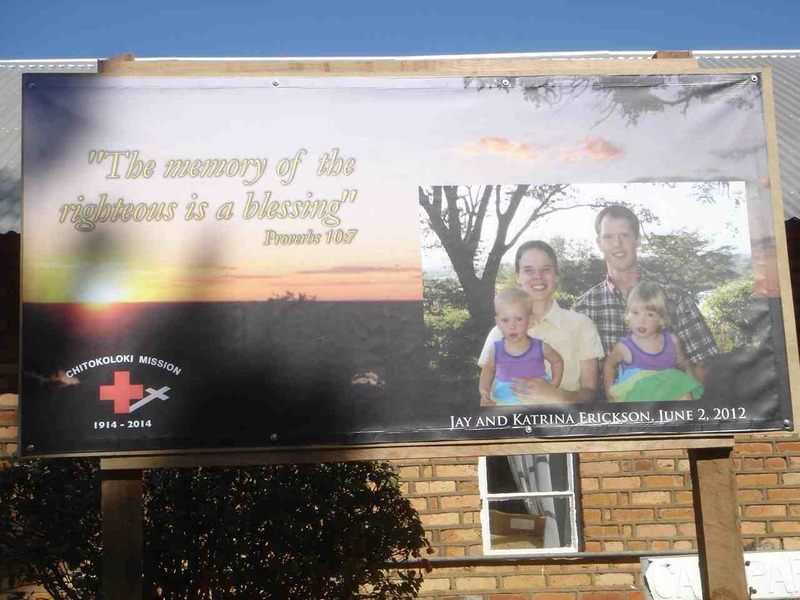 This week we erected a billboard at hospital with their picture and the quotation from Proverbs 10:7, “The memory of the righteous is a blessing”. For a picture of the grave site of Jay and Katrina which is overlooking the Zambezi River, refer to Post of April 2nd.